If you ask many people what they are afraid of the most, a lot of them will respond with 'spiders'. We think there are a lot of scarier things out there, but the truth is that most people would prefer not to come across a large spider - it's just human nature. There's nothing "itsy-bitsy" about this spider! If you have Arachnophobia, you might want to shield your eyes from this decoration. People who are scared of spiders will have a serious case of the creepy-crawlies once they get sight of this skeleton spider. This eerie arachnid looks great tangled inside a giant web in the front of your house or sitting on top of a tombstone in your graveyard! This creepy crawler is the perfect Halloween decor accessory. Simply add it to any shelf, step, or table for an extra scream from your guests! This spider is made of molded plastic and has painted spider details throughout. The leg joints and head are adjustable, so you can put this spider into any position you can imagine! 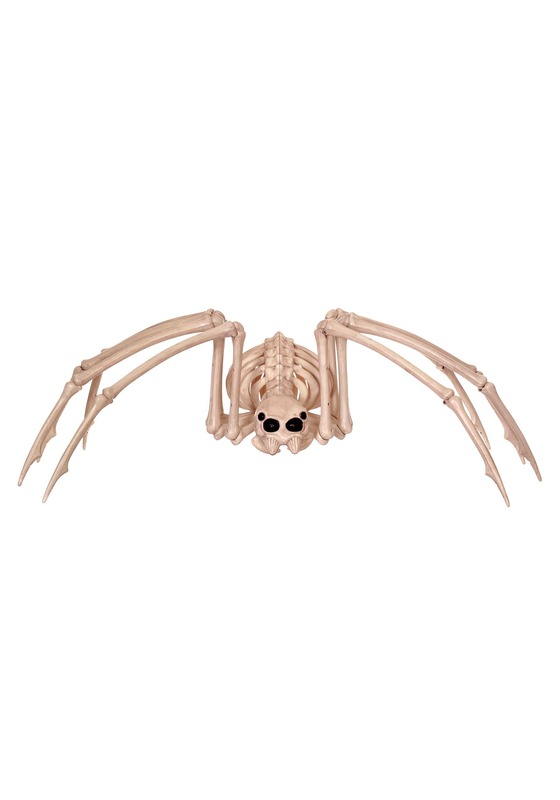 The spider prop has a leg span of 42" and is 13" tall, so it's sure to make an impression - a spooky one at that! Standard Prop Height 13" 13"